There’s something about buffets that entice most Singaporeans. My countrymen are known for being great bargain hunters. Anything that’s value-for-money, they’ll spot it with their eagle-eyes. I guess there’s nothing wrong about it. And man, when it comes to food. We people know how to enjoy. Enjoy I did, when me, Cheryl Anne and Adeline went to The Rice Table recently to celebrate Adeline’s 21st birthday. 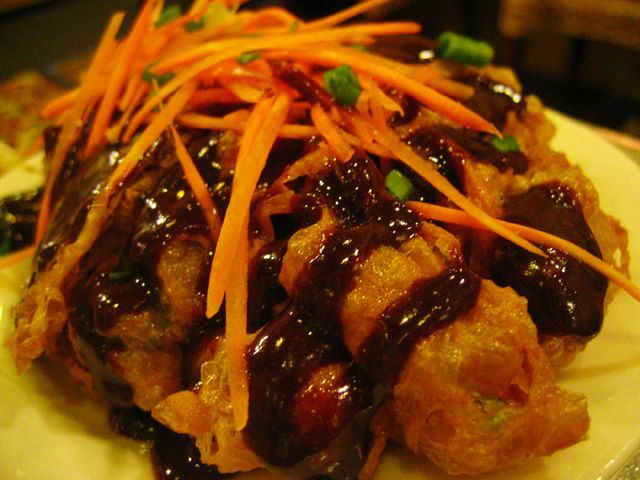 Their scrumptious tahu telor (tofu omelette) – not for those who hate fried stuff! 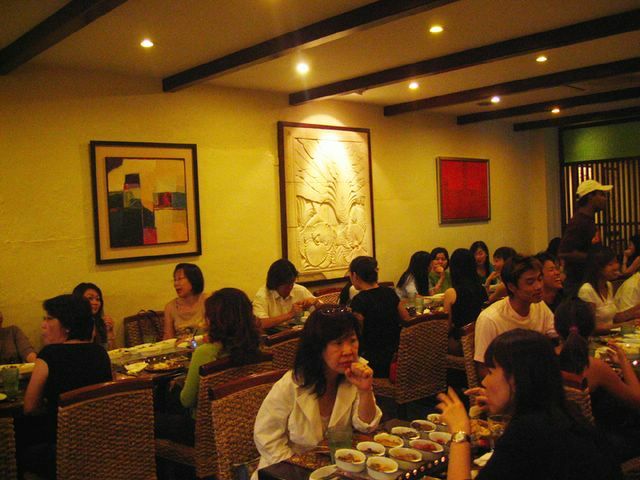 The restaurant serves lunch and dinner and all they have is the famed a la carte buffet. Why famed? Because the place is so well-known and ‘hot’ that you have to book in advance before you’re ensured a seat. Forget about a spontaneous decision to go eat there. You have to reserve at least a day in advance. It’s always packed. Their selection is wide and varied, which is good. You won’t get bored. There are more than 15 dishes and it’s okay if you’re not really a chilli lover – the food isn’t that spicy. As you can see from the photos, we ate like pigs. It was truly a huge feast! I ate till my tummy nearly burst. Now you see why I try to avoid buffets. 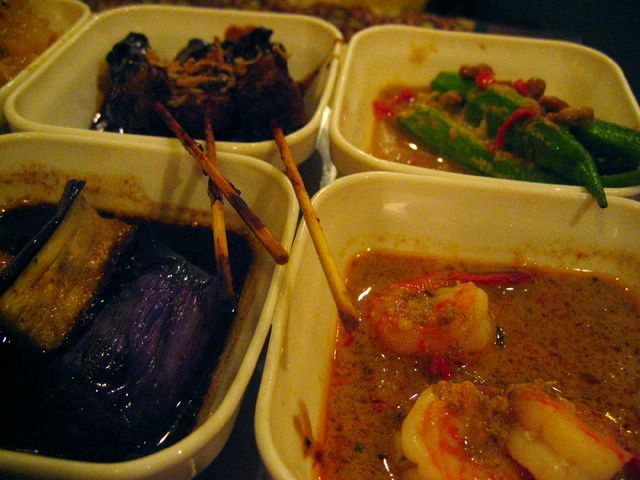 My favourites are the the Chicken Satay, Eggplant, and of course the sambal kangkong. Yes, I love my veggies and I totally dig Indonesian cuisine. Spices and curries and tasty treats rock my house down. Anyway it was truly a great dinner we had. You can never go wrong with The Rice Table. It’s perfect especially if you have a bottomless pit for a stomach. Spore always has such nice Indonesian food compared to KL. I like the way they serve it in small dishes. Yup, The Rice Table never fails. I just wish I’d known that in June, they were having a 4th-person-eats-for-free offer! 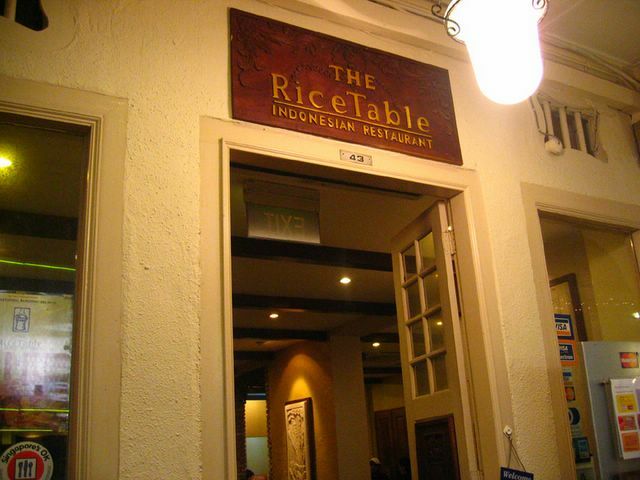 I ate at the Rice Table in Suntec City Mall when I was there about 6 months ago. I thought it was a great value for the money, however, I didn’t feel at all the dishes were done well. 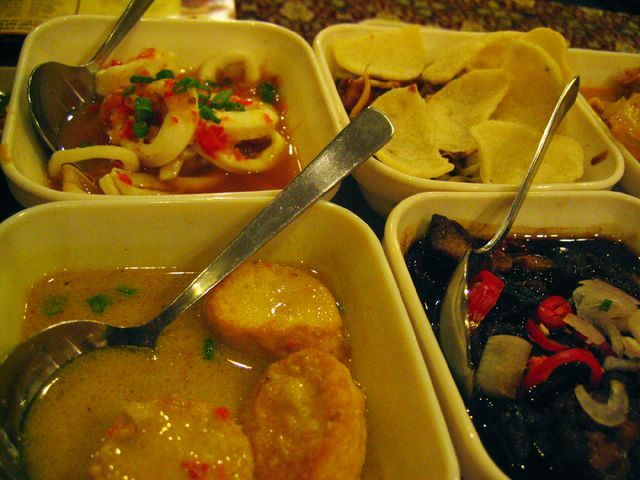 You’re just lucky to be able to have a wide selection of Indonesian food there in Singapore. 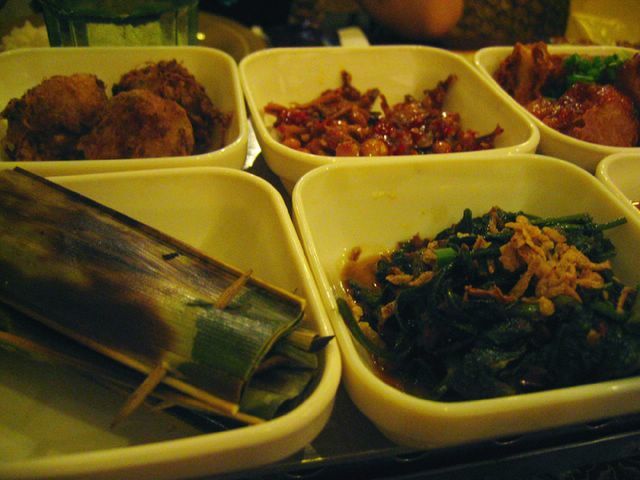 Ever try the House of Sundanese food (is that what it’s called?)? i love rice table!! 😀 yummy! boo: yes the dishes are really cute! well but KL has alot of other great food! i feel like just travelling there next week to pig out.. HAha.. crazy huh? tym: what? they had that offer? damn how come I didn’t hear about it!? reid: yea it is a great value for money. oh house of sundanese, i’ve heard but haven’t had a chance to dine there. you’re right about the wide selection of indo food though: there are just so many! i’m spoiled for choice.. always..
Do come to KL! It’s mega sale time starting this weekend, so there will lots of bargains in the shops. I heard that some places will even open until midnite! Email me if you want to meet up or just get some recommendations on what to eat.